All videos that you view on the popular video hosting website YouTube are logged by the service if you are logged in on the site during the time you are watching the video. While that may be great at times if you want to find that one video again that you watched a couple of days ago, it can also be embarrassing if other users work sometimes on your PC. If you do not want your friends to find out that you have a secret crush on Justin Bieber, you may want to make sure that the history is deleted by the time they use your computer. Plus, you may reduce the amount of data that Google has stored about you at the same time. It needs to be noted at this point that it is not possible to access another YouTube user's video watch list. You should also make sure to log out of public computers so that no one gets access to your data. There are actually two ways to find out about videos that a user has watched on YouTube. 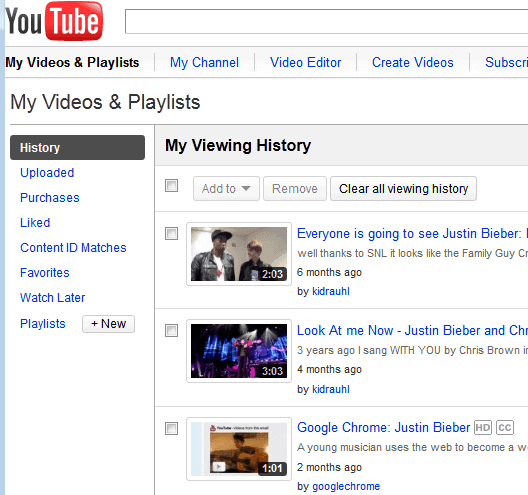 First by looking at the my viewing history page on YouTube which is only available if you are still logged in on YouTube. Second by looking at the browser cache. The second method works for as long as the browsing history is not deleted manually or automatically. Here is how you delete both histories. Go to the YouTube website and log in if you have not done that already. Locate your username in the upper right corner and click on the Videos in the menu that opens up. You can alternatively open the following page directly. The page lists all the videos that you have watched on YouTube. You can remove individual videos from your history by selecting them and clicking the Remove button afterwards, or all videos with a click on Clear all viewing history. The Login Helper website has a nice guide called Web Browser Maintenance that explains how you do that in all popular browsers. i want to know a way to STOP recording history on youtube. Press Ctrl+shift+Del Key and erase all history. OR you can use incognito mode of your web browser. I have noticed Google no longer saves my history. Robert which setting in particular are you referring to? I cannot really find a setting on YouTube to disable generation of the viewing history. In Account Settings I unchecked all checkboxes under Privacy and Activity Sharing. but there I found I had to manually change the privacy on each one. After I did all that I noticed then history remained empty. Must be something else as my videos are still being logged. course and I wonder if that’s a factor. the only other I have off is email notifications. I also have no connected accounts to YouTube. in combination with the changes I made did it. it ended after I did that. type “youtube” under search history >> enter>> select the results (use shift key to select multiple histoty) >> remove selected items. for more youtube tips tricks visit. Hi Martin, do you know when Youtube started logging a view history for non-signed in users? Was that something they did since the beginning?